Elkhart DJ’s keep the energy high at all functions. People who attend a function with one of our DJ’s on board will feel entertained whether they get up and dance or sit and watch one of our excellent DJ’s do their thing. Our Disc Jockeys keep the mood sociable and upbeat. At Elkhart DJ’s our speciality is Corporate Functions. ​How much does it cost to hire a DJ for a corporate event? What is the per hour cost? Can the DJ set up for the second half of the function, after the guests have eaten? When and where can the DJ’s set up their equipment? What kind of tracks do the DJ’s spin for corporate events? We are happy to discuss all of these issues with our customers. Our company, Elkhart DJ owns some sophisticated Karaoke equipment, such as a Karaoke machine and DJ Karaoke Software that is available for free download. Not only that, but we can also hire out DJ Karaoke MP3. This is something different, but we believe it works well for corporate events. You can ask us about our hourly and nightly rates for each of these services too. Ask as many questions as many questions as you like about our DJ’s programs for corporate events. Our presentations for corporate functions extend to day or night programs. We can also offer DJ services for weekend functions, or even a function that lasts for three or four days. Elkhart DJ’s have DJ’S for rent for all of these time slots. Our rates may vary for all of these different times. For instance, in some circumstances, the hourly rate may be cheaper for 3 days than it is for 1 day. We spin as many individual tracks as our customers request during a 3-4 day function. We also include repeat tracks, or blocks of repeated tracks, if the customer requires this. Our DJ’s at Elkhart DJ play tracks from our excellent song lists at every occasion. We have thousands of tracks in our repertoire. We fully understand that Corporate Events may require a different tone to parties or celebrations, but we can vary our presentation to suit. We are flexible and creative in the way we present our services; the customer chooses the tracks and the type of show they would like our DJ’s to put on. Our customers are welcome to ask our DJ’s to play music from a certain decade. They can also request that we wear a certain type of clothing, such as suits and ties for a corporate event. We never forget that our DJ’s are acting as MC’s in certain situations. Music can be a significant part of a corporate event, as it can affect motivation levels and mood. 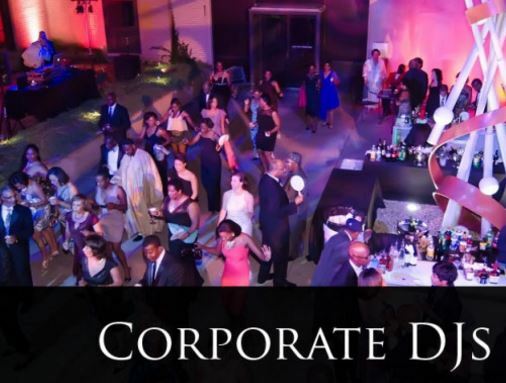 A corporate function will be structured quite differently to a party. Our DJ’S may still take some breaks during these functions. Music helps to create memories of many important occasions. We at Elkhart DJ are here to help you make an occasion memorable, so come and see us soon.